Brooks & Dunn, Country's Unlikeliest Duo, Set to Enter Hall of Fame: 'This Is Real Frickin' Weird' - Integration Through Media ....! For two guys who never planned to be a duo, so far Kix Brooks and Ronnie Dunn have done pretty well for themselves — and no better than on Monday when it was announced the legendary act will be entering the Country Music Hall of Fame. The two artists were present for the announcement, in the Hall of Fame rotunda in Nashville, and they expressed both their delight and their shock at reaching this career pinnacle together. Later, sitting with his partner for reporters’ questions, Dunn, 65, reaffirmed, “we did not want to be a duo.” Both he and Brooks chuckled at the candor. In fact, Brooks & Dunn became the most successful country duo of all time by any measure: 60 charted singles, more than 40 top 10 hits, 20 No. 1s, and 12 platinum-selling albums. Their songs include such timeless hits as “My Maria,” “Neon Moon,” “Red Dirt Road” and “Believe.” Their numerous industry awards, including CMA entertainer of the year in 1996, are just as impressive. And yet on Monday, Brooks also described their success as “weird.” Back in 1990, matchmaking music exec Tim DuBois put the two solo artists together for a songwriting session, which turned into a recording session, which became an album … and before they knew it, they boot-scootin’ boogied their way to superstardom. The duo also has a new album, Reboot, set for release on April 5; the 12 tracks feature some of their greatest hits in collaboration with an all-star cast of contemporary artists, including Luke Combs, Kane Brown, Thomas Rhett, Kacey Musgraves, Ashley McBryde, Brothers Osborne and Cody Johnson. 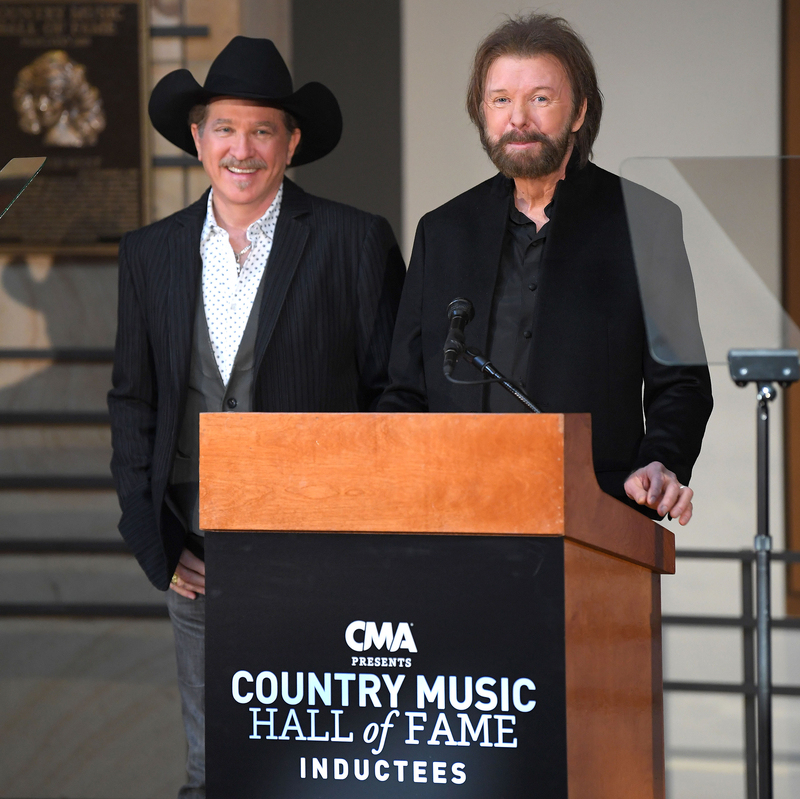 The Country Music Hall of Fame and Museum also is preparing to put Brooks & Dunn in another spotlight: An exhibit honoring their career was well in the works before their Hall of Fame election. It will open on Aug. 9. Dunn refers to the duo’s partnership as a “marriage,” and both are quick to credit one thing for its longevity. “I think the biggest thing has probably been having separate buses, don’t you?” he said, nodding to his partner. For two strong and independent men who intended to succeed primarily as solo artists, they both expressed pride in sharing a Hall of Fame plaque with each other. Brooks & Dunn will be formally inducted into the Country Music Hall of Fame, in the “modern-era artist” category, at a Nashville ceremony in October. Recording executive Jerry Bradley is the third member of the 2019 class, to be inducted in the “non-performer” category. Among a lifetime of accomplishments, Bradley produced Wanted! The Outlaws, country’s first platinum-selling album; signed Hall of Fame band Alabama to their first recording contract; and helped Hall of Famers Dolly Parton, Ronnie Milsap and Jerry Reed to pop-crossover success. His father, legendary producer Owen Bradley, and uncle, studio musician Harold Bradley, are also in the Hall of Fame.